Good day friends! Tis, the holiday season. I have enjoyed making Holiday wreaths throughout the years. 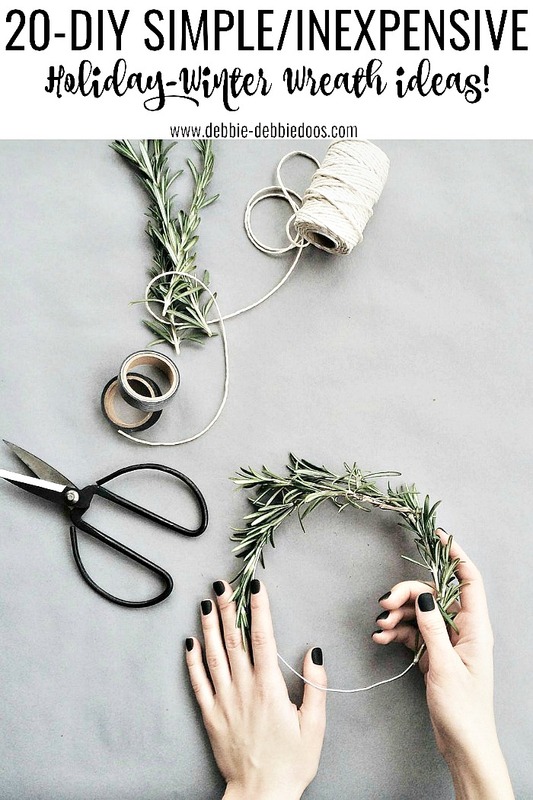 Today I am sharing 20+ DIY Holiday and Winter wreath ideas. Not only are they economical, they are something to be proud of. You don’t have to be a professional wreath maker to make holiday wreaths. Put your own spin on them. Use burlap, ribbon and flower colors you enjoy and love. Heck, they don’t always need to be traditional either. Think outside the box and come up with your own Holiday and Winter wreath ideas. I will leave a basic supply list at the end of this post. I haven’t myself made a lot of winter/Christmas wreaths. You will see mine are included. I have been more of a fall wreath, burlap wreath maker. This post even inspired me to make one this season and I will share mine when I do. I am thinking when my Mom and Sister come for Thanksgiving we will get our craft on together. The thumbnails at the end will take you to the tutorials direct. Your front door is always the first impression. Make it festive, fun and inviting. You don’t have to break the bank to do it. If you have a small budget, the Dollar tree is your one stop shopping place. They have everything from wreath forms, to ribbon, burlap and cute embellishments. No excuse not to get your craft on. They also make cute little teacher, friend or neighbor gifts. Your recipient will think of you year after year. Plastic snowflakes can be found at Dollar tree, along with holiday ribbons. Thanks so much for popping in today. I hope this inspires you to make your own Holiday-Winter wreath. These days you can find me over at Home Pressure Cooking. Not only cooking Instant Pot meals, but now I fell hard for the new Ninja Foodi. LOVE it! It is a Pressure Cooker, Air Fryer, oven, slow cooker, bake, broil and some even dehydrate all in one. Pretty cool kitchen appliance all in one. Great ideas for all types of wreaths !! Love your site , my go too for great craft ideas !! Got your little flower bundt pans – love them , perfect size for a couple – with no children left at home !! Also thanks for doing all the reviews on small & different appliances !! You do a great job ! !